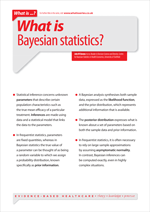 What is Bayesian statistics? | Whatis Series...? Statistical inference concerns unknown parameters that describe certain population characteristics such as the true mean efficacy of a particular treatment. Inferences are made using data and a statistical model that links the data to the parameters. In frequentist statistics, parameters are fixed quantities, whereas in Bayesian statistics the true value of a parameter can be thought of as being a random variable to which we assign a probability distribution, known specifically as prior information. A Bayesian analysis synthesises both sample data, expressed as the likelihood function, and the prior distribution, which represents additional information that is available. The posterior distribution expresses what is known about a set of parameters based on both the sample data and prior information. In frequentist statistics, it is often necessary to rely on large-sample approximations by assuming asymptomatic normality. In contrast, Bayesian inferences can be computed exactly, even in highly complex situations.